Critter Nation– Where their pups REALLY come from. Bailing Out Benji June 3, 2013 April 20, 2017 10 Comments on Critter Nation– Where their pups REALLY come from. During the summer of 2013, Bailing Out Benji assisted a small group with weekly protests in front of Critter Nation in Webster City, Iowa after we found out that he is using the same two breeders that Dyvig’s Pet Shoppe in Ames, Iowa uses. In retaliation to the weekly protests, the store decided to post this very professional statement on their facebook wall. Before these protests began, one of the women in charge of the events went in to Mike to talk about his breeders and the impending protests. Mike (the owner) claimed that he had never even visited one of them! Yet he “knows” they are reputable breeders. He confirmed that the breeders he uses are Century Farm Puppies in Grundy Center, Iowa and New Design Kennels in Rockwell City, Iowa. They aren’t. So, Mike and the rest of the folks at Critter Nation, before you claim that we are slandering “people”, please read here about the PUPPY MILLS that you are supporting. This is the research that you should have educated yourself with, all of it comes straight off of the USDA website. Maybe now you will think twice about selling puppy mills puppies in your store. Mike wrote this information down for us on the back of his business card. And here is how the store reacted to the protesters in front of their store. Before anyone asks, I have been to this puppy mill and personally rescued a dog from them. 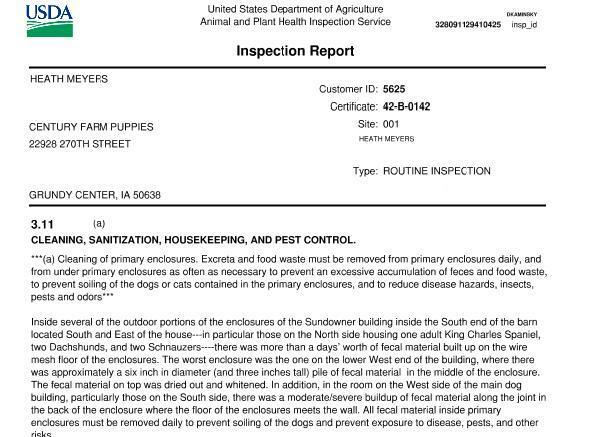 While their website paints a beautiful picture of their farm and talks of how they are the best kennel in the state, their past USDA reports scream a different story. This photo shows the number of dogs they are currently breeding. 155 adults, 48 puppies. That is a lot of dogs for one aging couple to care for. 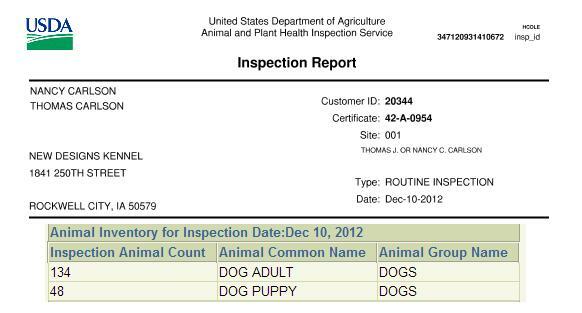 Century Farm Puppies has been downgrading in recent years due to public pressure and the fact that more people are “waking up” about puppy mills. In recent years they had over 500 adult dogs on their property, which is an insane amount of dogs to care for. Yes, during that time period, Critter Nation was using them as a breeder. Nancy and Tom Carlson of New Design Kennels are very deep in the puppy mill world. Not only do they have a huge puppy mill of their own, they run under TWO names so the public doesn’t see that they breed several breeds of dogs (New Design Kennel and Illusion Japanese Chin) but they sell their unwanted dogs at terrible dog auctions. Most recently, In May, Nancy and Tom helped out at another dog auction that I attended. These “reputable breeders” have no problem breeding dogs that aren’t healthy. If you read the article above, you will note that many of her dogs were missing teeth, eyes and had open wounds AT THE AUCTION! Below shows you an approximate number of dogs that she sells on her property and, below that, we highlight some of her violations. Did we mention that Nancy Carlson is an active member of the Iowa Pet Breeders Association? She works on the legislative end to make sure that laws aren’t passed that will hurt breeding facilities like the one pictured above. The world is waking up and seeing the pet store/puppy mill connection. It is important that the public understands where those cute pet store puppies are really coming from. Thanks, Mindi, for providing the research Critter Nation will not provide! Keep up the great work you do educating people! It’s been a dream of mine to some day own a big farm where I can have rescues to run around freely on acres of land.I’ve also thought maybe God doesn’t want me to have this because I’ll get carried away and have too many dogs.I was thinking anything over 25 would really be pushing it.How can anyone take over 100 dogs shove them in cages, keep them pregnant, filthy and unloved?We are not being radical.It’s just so obviously wrong and I can’t comprehend that our government doesn’t get it. Very good article! We need to print this off and have several for the protest this weekend. So people can SEE the pictures AND the numbers. Also need to blow up his card that he wrote on, so no one can deny he doesn’t use them. He must know he is doing something wrong, as he has deleted is facebook page where the discussion was held. What was being he said he didn’t want his loyal customers to see? How about the truth? I don’t blame people from buying puppies at pet stores, IF they don’t know what it really takes for those puppies to be there. Sadly there are some people who just….don’t….know. But there is nothing wrong with informing people of what is going on. And he knew about this protest ahead of time, and chose to do nothing about changing his ways. Keep up the good work! If you wren’t being effective the bullies wouldn’t be bothering you. Noodle says hi! My dog from Century Farms just passed away after 8 1/2 years. We had spent about $5,000 due to many health issues such as breathing problems, arthritis and high blood pressure. Thank you so much for writing this! I’ve been thinking about getting an Italian Greyhound and, although I want to adopt, I was checking out breeders earlier today. I saw that New Designs had “champion sired” puppies that you could have shipped to you (something that is always a red flag for me because I like to be able to see where the puppy came from). The second red flag was that there was hardly any pictures of the puppies other than one or two on a generic backdrop and there were NO pictures of the breeder, parents, or facility. The final warning sign was that, of the many puppies they had posted, several of them were “clearance” or “on sale”. It was like they were clearing out they’re stock of puppies. I wasn’t surprised to discover they were a puppy mill, but if I notice any of those signs, I probably wouldn’t have known any better. Hopefully, more people will learn the truth about this horrible place and stop giving them business! I like Jennifer was hours from my new companion. I believe they have a Maryland Address . Thank you for this article, but now I feel so awful about not rescuing that little guy. the legislation and audit reports are stifling to read. I would love to help. A friend of ours purchased her now 4-year old male IG, named Argus, from New Designs in Iowa. In April of 2017, she gave us Argus, since we already owned Molly, a 4 year old IG, since she was no longer able to care for Argus. Molly is a rescue, without papers, but a definite biggy Iggie with all of the characteristics of a pure bred IG. She’s our heart dog. She has the notorious high prey drive, is smarter than smart, velcro personality, runs like the wind and is very agile and dainty. Argus, who came with papers, is the size of a large Whippet, has very little prey drive, is clumsy and never runs fast. On careful review of his “papers”, the sire was not AKC and was from New Designs. The dam is AKC from Derricks IG’s. I cannot find Derrick’s IG’s on the internet. Also, Argus’ parents were both seal and white with wild Irish markings. Argus is tan with a bit of blue on his back. Sure, he COULD be their pup, but doubtful. With his incredible size, one parent was obviously quite large, yet they used the dog in their breeding program. Good breeders breed to standard and conformity! Not having paid a dime for sweet Argus, I can only say that New Designs is NOT a reputable IG breeder. Go elsewhere for the REAL IG folks, like Marchwind or someone similar. New Designs’ breeding program is just that…. a breeding program.